Beat eggs with sugar,add sour cream. Flour mixed with baking powder. To combine two mixtures and stir with a spoon. Divide the dough into three parts. One add 2st.l.cocoa and nuts in another 2st.l.cocoa,in a third Mac. Bake three cake layers,at 180 grams,about 15 minutes.Prepare the cream:mix sour cream with sugar. 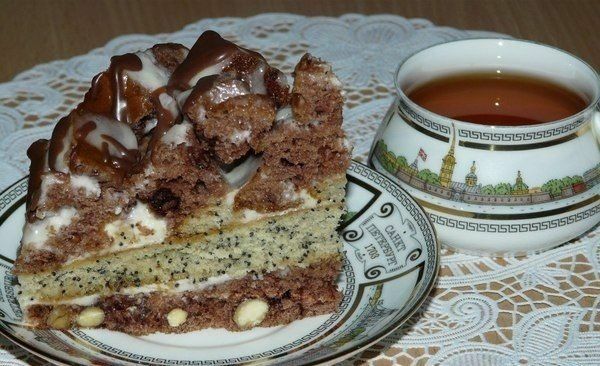 Collect our cake the First cake with cocoa and nuts add the cream,then light the cake with poppy seeds,again add the cream. The cake with cocoa cut into cubes,dipped in cream and lay in a chaotic manner from above.The remnants of the cream pour over the cake.Melt the chocolate and pour over sour cream.Put the cake in the fridge for a couple hours,preferably overnight.